Following are my slides from Collaborate 2016 in Las Vegas. My first session 'Architecting for the Cloud' was full house and it was great to see audience response as many of them asked me about the slides after the session. Unfortunately the OES session got low attendance as it was scheduled to be last session on Wednesday and many people left for the party. Here are my slides from the it. See you sometime in future. I will be presenting 2 topics at IOUG Collaborate 2016 in Las Vegas. 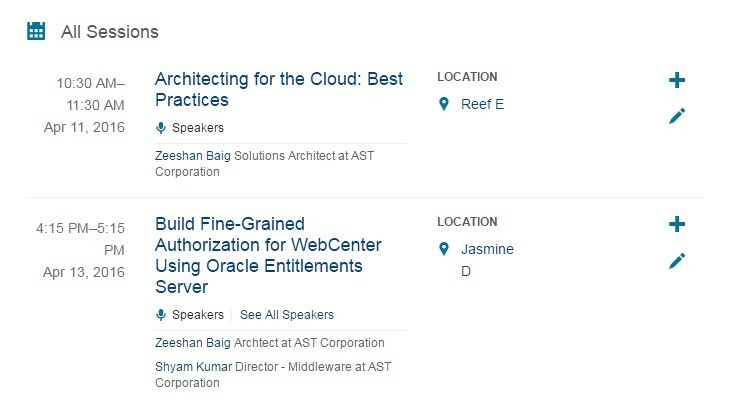 I will be talking about Architecting for the Cloud and Oracle Entitlement Server Integration with WebCenter. So make sure you mark you calendars to attend my session Learn and Earn.. see my session details below. Looking for an easy way to demonstrate the skills you'll gain by attending COLLABORATE 16? Earn an #IOUGenius Certificate! “Check-in” to 4+ sessions on your mobile app. Recently I had to install some Oracle products for a customer. I provided my list of pre-requisites to them as per Oracle docs. We usually create a user called 'oracle' as Linux software owner but due to security reasons we didn't had access to 'oracle' user directly. Instead everyone have their own ID (For example zbaig) and then you run the sudo command to switch user. You need X server running on your desktop. I use Xming because it is lightweight. A quick tip here this error could occur for many reasons I am documenting only one of the cases here. Sometimes when you create WebLogic cluster and after pack and unpack your domain files some Java security policies does not get updated on second node. When you try to start a Managed server you might see the following error in the logs and it will fail to start a server. In my case I was installing Oracle Entitlement Server (OES) in a cluster environment. (I have seen this exception on other occasions as well so its good to get it documented). Solution is grant permissions to Java Security on WebLogic resources, In my case it was Oracle entitlement server (OES) so I had to add following to weblogic.policy file where all the security policies are defined for WLS resources. Last week I presented a topic on Architecture for the Cloud Platform at RMOUG. The session went well I had around 20-25 people at 8:30 AM so no complains. Here are the slides from the session.